Core Exercises and Workouts, also called Core Stability or Strengthening Exercises are the key to a strong core and abs. These workouts can be done on the ball or using bodyweight. Men and women both benefit from core strength workouts. You can start by learning the importance of core training and the two units in abdominal muscles. From there move to learn the 5 best core exercises. Add few more killer inner and outer unit core exercises. Lastly pick these sample core training workouts and get started immediately. If you are looking for a serious core training program, then you can use the Combat Core training program with dozens of core exercises and workout programs. A solid core minimizes your chances of injury, corrects muscle imbalances and provide you with a pain-free better posture. Core Stabilization is vital to our existence. Core conditioning will decrease the incidences of Back Problems, ruptures discs, abdominal hernias and considerably improve your posture. Core Strengthening is much more than basic Abdominal Crunches as there are more components involved which require direct stimulation from other exercises. Total Core Stabilization includes strengthening both your Abdominals, Lower Back and Pelvic region. Core Training is not just having great abs nor is it only having sculpted abdominals, but these may be a part of total core fitness. For abdominal strengthening you should do trunk flexion and hip flexion exercises. Also check the Abdominal Training section for more details. For Lower Back Strengthening you should do trunk and hip extensions. Check the Lower Back Strengthening Exercises section for more details. I suggest you give Combat Core Strength Program a try as it will help you build amazing core strength with dozens of core training exercises. The Core consists of 2 units working in harmony with each other and helping you use your core in all its movements. The Inner Unit provides the necessary Joint stabilization for the spine and comprises of Transverses abdominis, pelvic floor and diaphragm. The Outer Unit comprises of the Internal and External Obliques, rectus abdominis and back muscles. My Top 5 Core Exercises for perfect core. If you are doing exercises like deadlifts and squats, you are already getting core muscles involved. Although the 5 best core exercises below target the core muscles very well, whenever perform exercises on the stability ball or BOSU ball. Involve single leg training like single leg squats, single leg deadlifts and one leg push ups. 1. 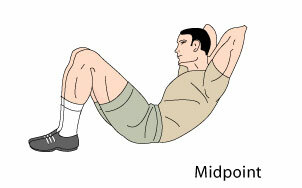 Abdominal Crunches and reverse crunches plus situps and hanging leg raises. 2. Abdominal Plank and Side planks exercise for total core involvement. play catch-ups with your partner, one of you lying down or passing each other standing back to back. Check Medicine Ball Exercises here. 5. Exercises like Deadlifts, front squats and bodyweight exercises. These are the best Inner Unit Exercises - Abdominis Tuck and Horse Stance Exercises. Get on your knees in a crawling position with your hands just underneath your shoulders and your thighs at 90 degrees to your back. Your head, spine and sacrum must be in contact with the rod. Ask someone to place a rod on your back to align the spine. Now breathe in and hold for 10 seconds. Let your spine remain static and use only your abdomen to breathe. Exhale for 10 minutes and repeat. Breathe In -10s, Hold -10s and Breathe Out -10s. Perform this exercise 4-5 times a day. 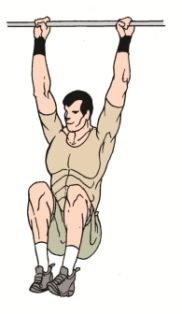 Now raise your right knee and left hand off the ground for 1-2 cms and hold this position for 10s. 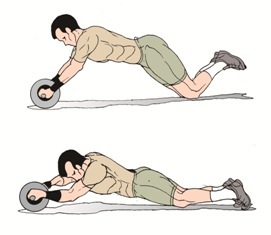 These are the Best Outer Unit Exercises - Alternating Dumbbell Press on Swiss Balls and Dumbbell/Barbell Bent over Rows. Pick a Swiss Ball appropriate for your size. Grab a pair of dumbbells and lie across the Swiss Ball. Make sure you are lying on the shoulder blade. Your head should be on the ball and not in air. Now press the dumbbells in an alternating fashions, right followed by left, one extending and the other flexing at the same time. Stand with a narrow stance and grab hold a bar with overhand grip. Bend down with knees slightly bent and let the bar hang in front of you. Now use the back and raise the bar until it touches the abdominal region. Lower the bar under control to starting position. Create your own by picking any 3 core exercises explained above and do as many repetitions as possible. 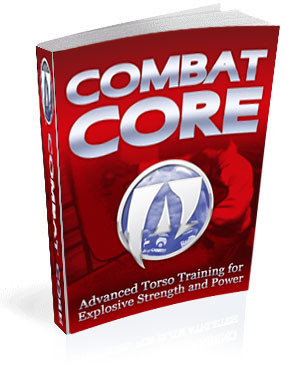 Combat Core Strength, an advanced Combat Conditioning Program to Build Amazing Core Strength. Click here to Visit Combat Core Strength Program. Do Not forget the good old Abdominal Crunch Exercise. Its a great exercise to develop the Rectus Abdominis Muscle, get a six-pack abs and create a powerful trunk region. Also there are many more Core Strength Workouts. 1. How to inflate a core stability exercise ball? The best way to inflate a core stability exercise ball is with a powered or hand air pump. Just be careful not to over inflate it. 2. How do you inflate a core stability exercise ball? 3. Has anyone lost weigh using core rhythms exercise video? Many people have had great success with the core rhythms exercise video. Of course, the more you put into any workout, the more you will get out of it. 4. How to use core secret exercise ball? It is important to make sure that you are carefully using the core secret exercise ball if you are new at it or have trouble balancing. Make sure that the ball is always being placed in the correct position and you will be able to complete all of your core exercises. 5. Where to start core exercise? A good exercise to start with would be that of the dumbbell arm bar and the arm pump. Throw in a few crunches and you are off to a great start for core strength. 6. How often should I do core exercises? Some people will tell you that you should do the core exercises every single day. However, you should allow at least two or three days a week for your muscles to rest, relax and rebuild stronger. 7. What are the best core strengthening exercises with fitness ball? Crunches are by far considered to be the best core strengthening exercise with a fitness ball. 8. How to use ropes for core workout? Believe it or not, jumping rump is one of the best core workouts you can get from the use of a rope. 9. Any Core workouts you can do at home? There are a lot of core workouts that can be done at home. Actually, just about all of them can be done anywhere you have the space and the time. 10. What is a core fusion workout? The core fusion workout that combines some of the best core exercises. It is certainly intense but it proves to bring great results. Back to Top of Core Exercises and Workouts Article.